Two frequently recommended texts in the burgeoning church planting literature are Aubrey Malphurs’ Planting Growing Churches for the 21st Century: A Comprehensive Guide for New Churches and Those Desiring Renewal and Stuart Murray’s Church Planting: Laying Foundations. This essay seeks to engage with the theological proposals evident in these two books by identifying the foundational theological ideas and assumptions in each, contrasting them, and offering fresh critical reflection. The first edition of Planting Growing Churches, now in its third edition and seventh printing, was published in 1998. 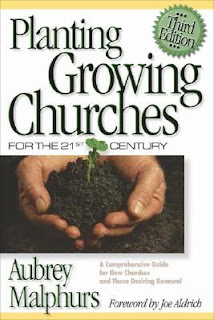 Aubrey Malphurs, Professor of pastoral ministries at Dallas Theological Seminary, devotes the first 74 pages of this 430 page tome to “The Preparation for Church Planting” which covers his definition of church planting, the reasons for undertaking it, how to make ends meet and the assumptions which undergird his approach. Indeed, Malphurs is eager to assert that “church planting is a deeply theological enterprise” (27). He defines church planting as “an exhausting but exciting venture of faith that involves the planned process of beginning and growing new local churches, based on Jesus’ promise and in obedience to his Great Commission” (19). Three features of his definition are of particular theological significance. First, Malphurs’ defines church planting as a “venture of faith,” indicating later that this faith is a matter of both believing God and obeying God. While the active dimension of faith which Malphurs’ has highlighted is justified and he insists that this faith is in God’s ability to do the impossible, throughout Malphurs’ gives the indication that church planting is really the work of people and that its success rests firmly in their hands. For example, while describing the difficulty of the work, Malphurs claims that “church planters “reap what they sow.” If they work hard, the ministry grows; if they take it easy, the ministry plateaus and eventually dies” (19). Indeed, even in his discussion of faith, there is a clear emphasis on the subject of faith, rather than its object; those who have faith feature more prominently in his discussion than the God in whom faith, of whatever degree, is placed. The main thing to say about faith, for Malphurs, is that church planters need to both have it and act on it in order to impress God. This logic, which stresses the strength of a person’s faith over the strength of faith’s God, flies in the face of Jesus teaching when he suggested that those with only a mustard seed’s portion of faith in God could commands mountains to move (Mt. 17:20). Second, Malphurs rests church planting on what he calls Jesus’ promise, found in Matthew 16:18: “And I tell you that you are Peter, and on this rock I will build my church, and the gates of Hades will not overcome it.” This text, which Malphurs invokes repeatedly in the early chapters, is interpreted with emphasis on Christ’s promise to “build” (read "grow") the church. As a result, Malphurs’ ventures a prediction of prophetic proportions: “Not only will the church in America survive, we are at the very beginning of a groundswell that is about to sweep across America sometime in the first half of the twenty-first century” (28). Pew studies have not been kind to this ill-advised prediction. Though he later notes the numerical rise and fall of the church over the centuries since Jesus spoke these words—even acknowledging that Jesus’ promise is really about the persistence of the church, not its numerical growth—his vision for church planting regularly comes off as triumphalistic. The book’s back cover declares in bold type “It’s not about numbers” and yet Malphurs makes clear his conviction, no doubt tied to his read of Jesus’ promise, that “quality churches become quantity churches” (66). For Malphurs, church planting is founded on the belief that Jesus will build (grow) the church such that its advance will not be stopped even by hell itself. Third, and finally, Malphurs’ views church planting as a response of obedience to Great Commission, which he takes to be the definitive statement of the church’s mission. While he includes ministries focused on maturing believers in his understanding of the Great Commission, it is clear that, for Malphurs, the weight of this mission is a matter of conversion, since he points to a stagnant percentage of adults in the US who “have accepted Jesus Christ as their personal Savior” as an indication of churches failing in mission (29). With an understanding of the Great Commission that emphasizes evangelism over edification, Malphurs makes the link to church planting by appealing to Acts: “A careful reading of Acts reveals that the early church implemented the Great Commission mandate primarily by planting churches” (42). Stuart Murray critiques this directly when he notes how frequently church planting authors make this leap “as if establishing a New Testament basis for evangelism automatically established a similar basis for contemporary church planting” (67). Stuart Murray, Oasis Director of Church Planting and Evangelism at Spurgeon's College in London, published Church Planting in 2004, and it reads as a critique of the theology found in church planting literature (such as Planting Growing Churches for the 21st Century). Murray proposes to “construct a theological framework for church planting that will provide a more secure foundation for action, and a more sensitive basis for evaluation and planning than currently available” (18). Positioning theological reflection on church planting at the intersection of ecclesiology and missiology, Murray points to three key theological concepts: missio Dei, incarnation and the Kingdom of God. First, Murray situates church planting as an expression of the churches participation in the much broader mission of God. The doctrine of missio Dei emphasizes that Godself is missionary by nature, that the scope of God’s mission is cosmic and that the energy for all mission and ministry originates in God. Whereas Malphurs’ logic proceeds from the Great Commission to the primacy of evangelism and from here to Peter Wagner’s oft-quoted declaration that “The single most effective evangelistic methodology under heaven is planting new churches,” Murray begins with a definition of mission that is both theocentric and wide in scope. His emphasis on the theocentric nature of mission and its power is a welcome corrective to Malphurs’ anthropocentric focus on the strength of an individual’s obedient faith. In further contrast, while Malphurs points to Jesus’ Promise as a guarantee of the church’s progress, Murray includes the whole Trinity in a mission whose scope exceeds the walls of the church. Indeed, he stresses that “the broad scope of missio Dei must not be reduced to evangelism or church planting” (40). In the light of missio Dei, church planting is seen to occupy a modest but critical role as a practice whereby the church participates in God’s cosmic work of redemption. Second, the incarnation offers to church planters a paradigm for understanding the way in which God goes about God’s mission. The missio Dei is cosmic in scope but reaches its focal point in the incarnation of Christ (42). For Murray, the implication follows that it is Jesus, “rather than the early church” that ought to be the central inspiration for church planters (42). Again, this is clear point of contrast with Malphurs, who concentrates attention in Acts as a guidebook for church planters. More importantly, the incarnation demonstrates that the divine mission methodology is to speak through becoming flesh. While gospel proclamation is an irreplaceable dimension of incarnational mission (translating divine truth into human language was no less a miracle than embodying divine spirit in skin and bones) it is also necessarily seen through deeds. Murray provides a critical insight, “Church planting cannot be equated with participation in missio Dei unless these churches are communicating good news to the wider community and incarnating the good news that they are proclaiming” (45). Third, and finally, Murray suggest that the doctrine of the Kingdom of God can help to undergird theological reflection on church planting. Importantly, Murray stresses, the kingdom must be distinguished from the church, especially given the unfortunate frequency with which church planting practitioners and authors imply that it is “as if the kingdom advances primarily, if not exclusively, through church planting” (46). The kingdom, he suggests, is bigger than the church and missionaries must expect to discover God at work wherever they might find themselves. Murray distinguishes church from kingdom by defining the former as a community and the later as “an activity: God extending his rule throughout creation” (47). While a distinction between church and kingdom is needed, Murray’s formulation here leaves something to be desired. Despite his Anabaptist commitments and a distaste for ecclesial expansionism, he defines mission as the “advance of the kingdom” with all the military connotations it implies (50). In truth, the kingdom is a something that comes, as Jesus taught us to pray it would, and something which persons are invited to enter and to receive, but it is not something that advances, extends or conquers in the sense that those military-born terms imply. Much better is Murray’s suggestion that it is the kingdom, rather than the church, which defines the scope of the missio Dei. Hence, the mission should be understood as an activity, but the kingdom best conceived of as a state; the kingdom of God is the realm in which God’s shalom intentions are actualized. It is the reception of the kingdom that the missio Dei seeks, and to which church planting can make a notable contribution. It should be fairly obvious at this point that, Murray’s theological reflection on church planting is to be much preferred to Malphurs’. The missio Dei, incarnation and kingdom of God, each of which draw on major scriptural themes evident across numerous the books of the Bible, provide a much broader and well developed theological foundation than bare appeals to Jesus’ Promise and the Great Commission, two solitary verses which it could be argued Malphurs has poorly interpreted and applied. In the remaining paragraphs, this essay will revisit the Great Commission and follow the trail set by a number of corrections that Malphurs’ use of it calls for. The Great Commission is not necessarily a poor text to include in theological reflection on church planting, and many have judged it to be a succinct statement of the church’s mission with good reason. But the passage came to bear such significant missionary weight after 1792, when William Carey published An Inquiry in the Obligations of Christians, to Use Means for the for the Conversion of the Heathens. Since its release, teaching on the Great Commission (and mission in general) has become ridden with guilt. Roland Allen and Lesslie Newbigin have both pointed out that Paul is nowhere found offering “exhortations to missionary zeal” (Allen 93) . The driving focus of Paul’s teaching was not that the early churches must be obedient and fulfill the Great Commission, but rather that they needed to attend to the quality and nature of their life and lives, such that their community might prove a winsome testimony to the gospel. Indeed, Paul is very concerned with Christian witness, a fact which is evident whenever he explains the purpose of his household codes. (For example, Paul instructs slaves to be submissive “so that God's name and our teaching may not be slandered,” 1 Tim. 6:1 NIV). Paul is, without question, personally and wholeheartedly invested in the missio Dei through work of church planting but even so he does not evidence any anxiety about whether the churches he has planted will be obedient to their missionary obligation. Mission, Paul would seem to suggest, is not the sort of thing best motivated by guilt-ridden appeals to obligation and obedience—what could possibly be less winsome that anything done in a spirit of coerced duty? Perhaps if a church has to be admonished to engage in mission, there is a deeper more fundamental issue, either the misapprehension of the gospel, or—more likely—a failure to receive the missionary Spirit, that must be addressed. It is here that Malphurs’ appeal to obedience to the Great Commission, while well-intentioned, misses the mark. Perhaps a significant contributor to the misapplication of the Great Commission results from a difficulty of translation. Champions of the Commission from Carey to Malphurs have laid emphasis on that first little word, “go,” designating it an additional and prerequisite injunction to the command to “make disciples.” While the missio Dei and incarnation alone are ample justification for a concept of mission which purposefully “goes” to the ends of the earth, that first word of the Commission adds nothing to it, since it is better understood to mean “as you’re going.” Jesus commissioned the disciples for ministry on the way, not overseas missions per se. This no doubt connects to the first and final lines of the Commission, both of which are conspicuously absent from Malphurs’ treatment: “All authority in heaven and on earth has been given to me…And surely I am with you always, to the very end of the age” (Mt. 28:18, 20 NIV). Jesus declares his power and promises to be present with his disciples wherever they find themselves, regardless of whether they have been driven there by missionary zeal or persecution—as was sometimes the case. Both of these statements relativize the strength of faith and the courage of obedience required of the disciples in the intervening verses upon which Malphurs and others fixate. It would seem these promises of power and presence are equally, if not more, relevant than that to which Malphurs directs such attention. The results of this brief retreatment of the Great Commission serves largely to reinforce the centrality of the theological concepts Murray has put forward. The missio Dei to which church planting can contribute, is most fundamentally an action of God empowered by God. Like all the activity of God’s mission, it arises naturally and freely from the heart and life of God. Thus it ought not to be coerced by appeals to obligation and obedience. As Roland Allen notes, hinting at the centrality of the incarnation, “Christians receive the Spirit of Jesus, and the Spirit of Jesus is the missionary spirit, the Spirit of Him who came into the world to bring back lost souls to the Father. Naturally, when they received that Spirit they begin to seek to bring back others, even as He did” (93). The motive for church planting must faithfully incarnate the motive of God—love freely given—even as the method of church planting must faithfully incarnate God’s move-into-the-neighborhood methodology. For indeed, in a world where the kingdom is open to those who will receive it and all authority has been given to Jesus, neither duty-based appeals to obedience, nor anthropocentric renderings of the conditions for success can undergird the faithful practice of church planting. Allen, Roland (1962). Missionary Methods: St. Paul’s or Ours? William B. Eerdmans Publishing. Newbigin, Lesslie. (1989). The Gospel in a Pluralist Society. William B. Eerdmans Publishing. Malphurs, Aubrey. (1998). Planting Growing Churches for the 21st Century: A Comprehensive Guide for New Churches and Those Desiring Renewal (3rd ed.). Baker Books. Murray, Stuart. (2001). Church Planting: Laying Foundations. Herald Press. Check out more posts on church planting here. Wow! Interesting notes. I wanna introduce you to one of the most passionate authors on the topic of "Church Planting"- Dag Heward-Mills. In his book "Church Planting", he outlines various steps to successfully planting churches for the Lord. I believe anyone who is equally interested in planting churches must get a hold of this book. After over 1200 churches in more than 50 countries, no one could be as dependable on this topic as Dag Heward-Mills. Yep, those Anabaptists have a much-needed non-violent approach to mission!